There is no doubt that Florida is known for its lively beaches and stunning attractions. Throughout the state, you’ll find many beach towns with much to offer, and Clearwater is most certainly the best. From its colossal boardwalk to its can’t-miss events, our movers in Clearwater break down why this beach town is Florida’s best! An Active Boardwalk: There is always something to enjoy on Clearwater’s boardwalk, including a nightly celebration on Pier 60 with live entertainment, shopping, food and more. Beachside Restaurants for Every Occasion: Whether you’re in evening wear or cut-off shorts, there is a beachside restaurant to make you comfortable and satisfied. Seafood lovers are especially in luck since restaurants here are known for their fresh fish, including the locally loved grouper sandwich. Celebrities: Clearwater Beach is popular with everyone, and that includes celebrities! Take a walk along the boardwalk to shop for handmade jewelry, specialty clothing and more, and you might just rub elbows with the stars. Wrestling star Hulk Hogan even opened his own shop here in 2012. The soft white sand and clear blue waters of Clearwater beach are here to greet you with open arms. Even during peak season, you can find a place to lay out on Clearwater’s 3-mile-long and 3-block-wide expanse. Whether you want to enjoy one of the beach’s many activities, hang out with a large group or enjoy a day of sun by yourself, there is room for it all on this huge beach. 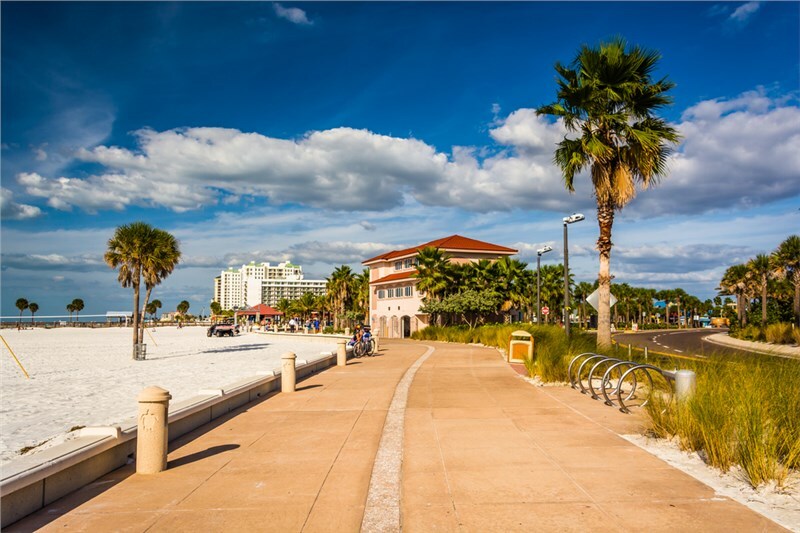 Stretching out in the sun or going for a leisurely swim is great, but there is so much more to do at Clearwater Beach. Sports: Join a volleyball tournament hosted by the Sunshine State Volleyball Association for exercise, fun and a little competition. There is also swimming, fishing, surfing and Jet Ski areas. Boating, fishing and golfing are also at your fingertips. Sunset at Pier 60: Where else can you get a nightly party complete with street performers, musical acts, food vendors and more? Pier 60 has a nightly celebration that starts two hours before and runs two hours after sundown. This is thebest way to enjoy Clearwater’s gorgeous sunsets. Dolphin Watching: The warm waters of Clearwater attract more than just people. Here, you can get an up-close-and-personal view of majestic dolphins in their natural habitat. You might even see the celebrity dolphin, Winter, which starred in the movie Dolphin Tale. Ready to take the plunge into Clearwater’s sparkling blue waters and sandy beaches? Clearwater movers, St. Pete Moving & Storage, are here to help you get started on living like you’re on vacation every day. To find out more about what Clearwater moving companies can do for you, give us a call or fill out our online form. We’d be happy to provide you with a free estimate!